Voted Sandals “World's Leading All-Inclusive Company” 19 years in a row. “Caribbean's Leading Hotel Brand” 20 years in a row. 2014 Six Star Diamond Award - American Academy of Hospitality Services. 2014 Five Star Diamond Award for Butch's Chophouse. 2014 Green Six Star Diamond Award - American Academy of Hospitality Services. 2014 Green Six Star Diamond Award for the Red Lane Spa. Perched atop the Italian Village, these magnificent oversized Love Nest Suites are the pinnacle of luxury. 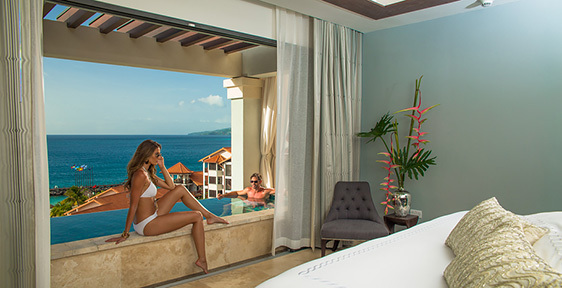 The exceedingly romantic bedroom boasts a king-size bed with direct access to a private cantilevered, solar heated plunge pool with infinity edge where couples can admire the stunning ocean while floating in the sky. Equally impressive is the suite's living room complete with an indoor dining table, writing desk with plush sofa, a smart television, a butler pantry, and fully-stocked wet bar featuring premium spirits. The stylish living area leads to an expansive balcony and features an opulent Tranquility Soaking Tub-ideal to relax while soaking in the Caribbean's surrounding tropical beauty and splendor. Exquisite details including Carrera marble vanities with backlit mirrors, a Kohler claw footed tub, separate frosted-glass shower and flooring made of Turkish ivory patika travertine natural stone with accents of pebbles adorn the luxurious bathroom. Butler Elite and 24-hour room service included. 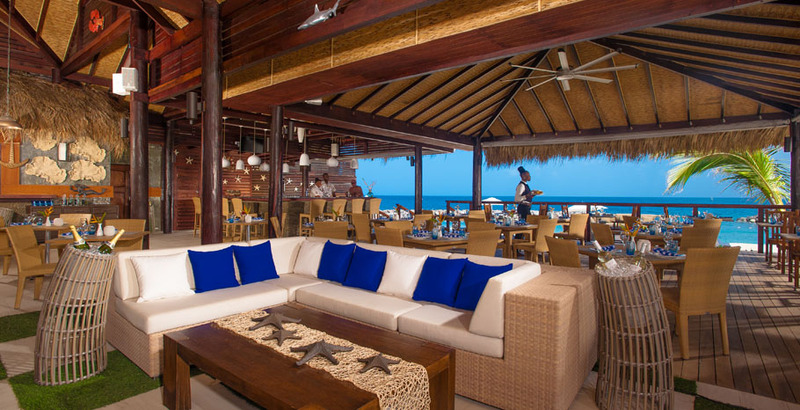 The culinary experience at Sandals LaSource Grenada is unlike anything else you'll find in the Caribbean. Savor an epicurean adventure that takes you from the passionate palate of Rome and the sophistication of France, to the delectable bounty of the sea and the Caribbean's first true steakhouse. Whether you crave an evening of fine dining, the casual atmosphere of a brick oven pizzeria, a playful pâtisserie or a lively Teppanyaki table, ten thoroughly unique venues offer the cuisine and ambience certain to suit every mood and whim. Indulge in fresh pastries, gourmet espresso beverages, ice cream, gelato and more. Their weekly chocolate buffet is at 9pm on Thursdays. Special Dietary Needs: For those persons with Special Dietary needs, please make contact with their culinary experts who will be more than happy to assist as best as they can. Prepare to be awestruck. While scuba diving in the turquoise blue waters of the Caribbean, you'll marvel at the healthy reef systems and well-preserved wrecks. The alluring island seascape offers enchanting encounters with a huge variety of marine life, from tiny coral shrimps and reef sharks, to Hawksbill turtles and everything in between! 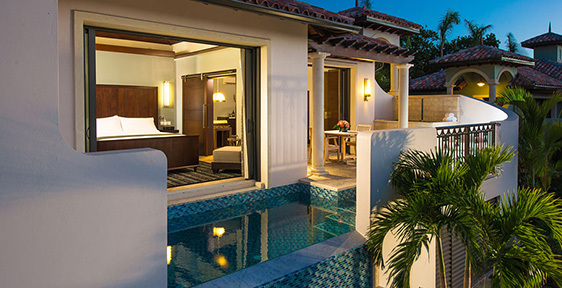 Take the plunge at Sandals Resorts, where unlimited diving is included. New resort boutique offering a fantastic selection of fine jewelry including ranges from world renown luxury jewellers Roberto Coin and H Stern, and a selection of timepieces from Longines, Gucci, Tissot, Rado and Michael Kors and more, all at duty free prices. 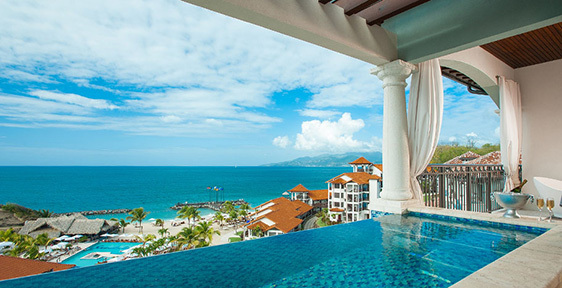 Caribbean-inspired spa treatments using regional natural products are available at the exclusive Red Lane® Spa at Sandals LaSource Grenada. A tranquil sanctuary, the Spa offers a number of treatment rooms, a fitness center, beauty salon and steam room. A state-of-the-art gym to match your personal best is fully equipped with LifeFitness® treadmills, exercise bikes, elliptical trainers, step machines, and weights in an air-conditioned facility.